Divided back, Real Photo Postcard. 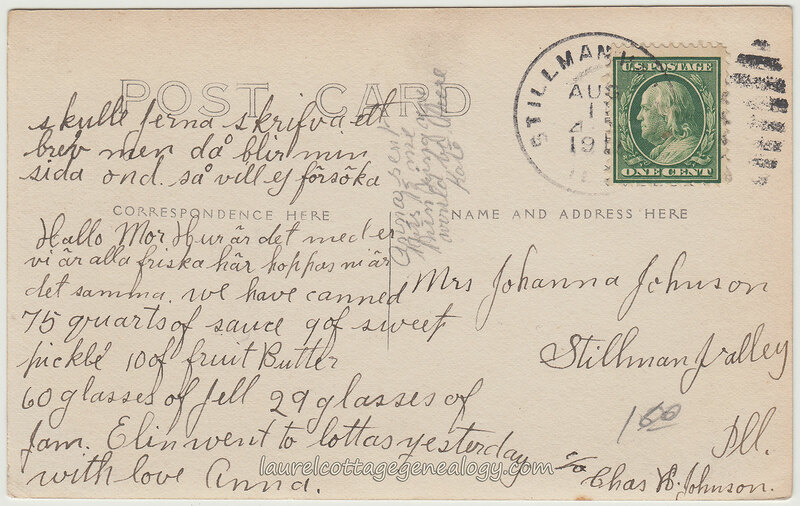 Postmarked from Stillman Valley, Illinois, circa 1910 – 1919. Well, shouldn’t the ã and õ be spelled ä and ö? 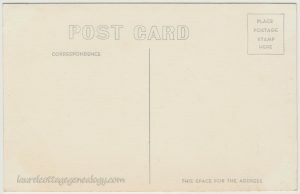 This postcard is from about 1910 (You can’t quite read the postmarked year but it looks like it’s the 1910s for sure.) Maybe it’s a historical difference in the letters with accent marks? I will find out shortly and update this post. According to a couple of census records, Anna’s mother, Mrs. Johanna Johnson was born in Sweden in July, about 1840. 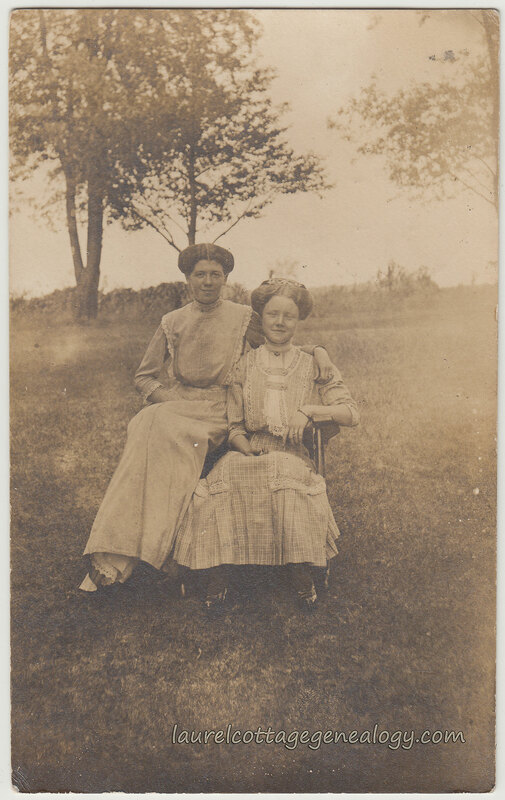 The 1900 Federal Census for Rockvale, Ogle County, Illinois shows she is with her husband, Gust (Gustav?) L. Johnson, who is born in Sweden, September, about 1832. 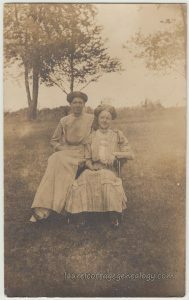 Their son, Charley H., was born July, about 1877. 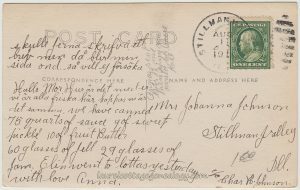 Johanna and Charley emigrated to the U.S. about 1884, and Gustav the year before. The family is farming, and Johanna is listed as the mother of eight children, five of whom are living in 1900. By the 1910 census, Charles is married (Sophia) and they go under the spelling of Johnston. Johanna is widowed but living with her son and daughter-in-law. Also in the household by this time, is Swedish born, John Levin, hired farm labor. Sources: Year: 1900; Census Place: Rockvale, Ogle, Illinois; Roll: 333; Page: 6B; Enumeration District: 0090; FHL microfilm: 1240333. (Ancestry.com). Year: 1910; Census Place: Marion, Ogle, Illinois; Roll: T624_314; Page: 4B; Enumeration District: 0077; FHL microfilm: 1374327. (Ancestry.com). Divided back, unused, commercial-type Real Photo Postcard of Arctic Blue Fox. Photographer: Robinson. 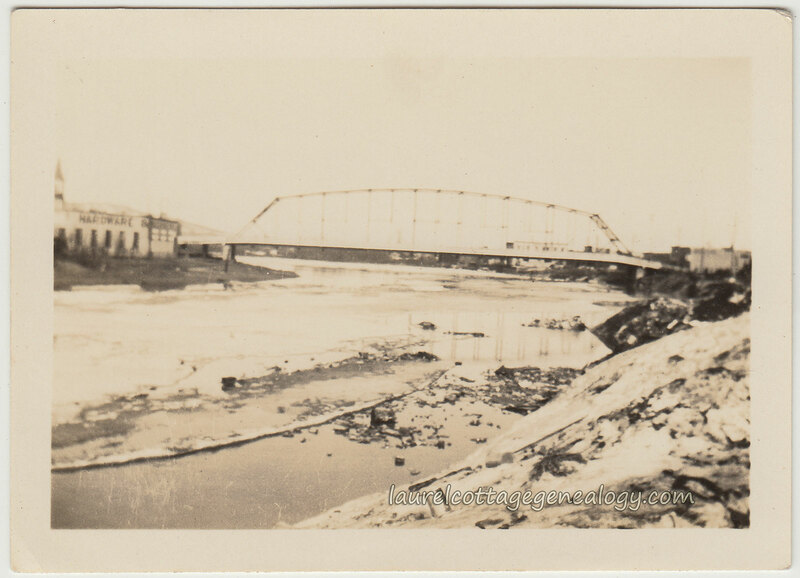 Number or Series: 316-E. Circa late 1940s. 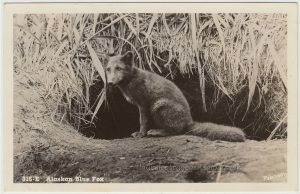 The blue (a smoky gray, blueish gray or black) is a color phase of the Arctic Fox. See photo 4/16 by Bjorn Anders Nymoen (Your Shot) in this link. 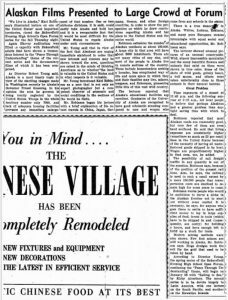 The Bakersfield Californian, Nov. 18, 1949. Reminiscent of My Cousin Vinny…. 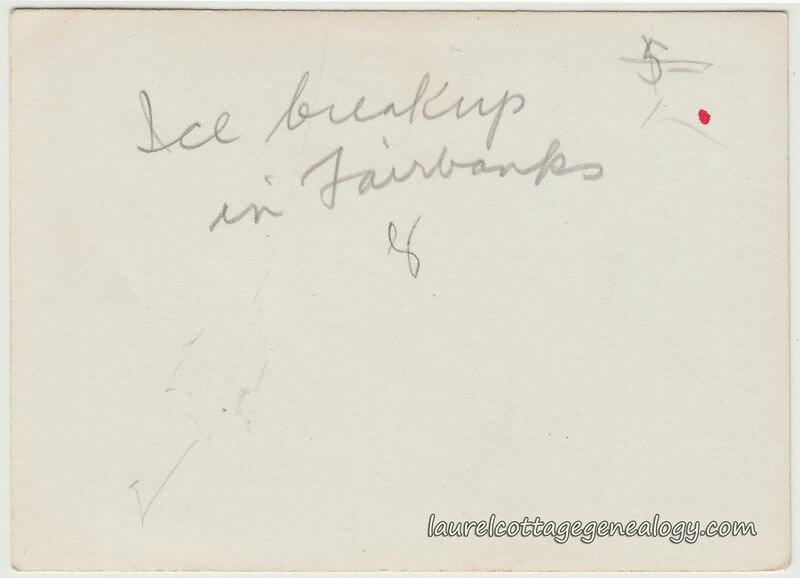 In researching other possibilities for photographers named Robinson, we find a color postcard of Franklin Street, Juneau, Alaska attributed to a Howard Robinson under publisher J. Boyd Ellis for sale online. However, also for sale, but in black and white and signed “Robinson” (same as our postcard above) is almost the exact same view of Franklin Street. The large clock in both photos show the time as two minutes apart. Are we to believe that two photographers with the last name of Robinson showed up at the same time to take photos of this street, from an identical angle? Highly unlikely. More likely, the color version was adapted from the black and white photo. 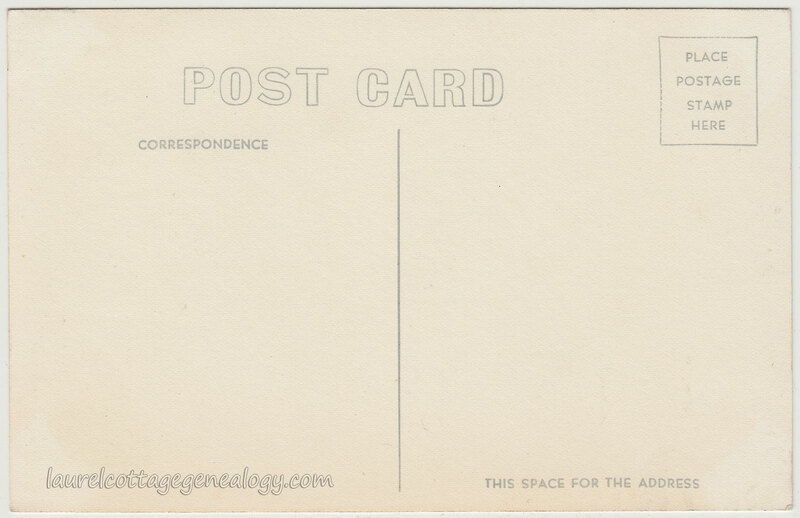 (We’ve seen this a number of times in the world of postcards. Images are slightly altered, for example, a person is added into the scene, or taken out. Sometimes it’s quite obvious, other times, not so much.) 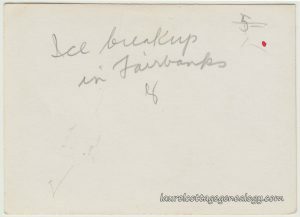 To compare the two, here’s the digital page from Card Cow that, at the time of this post, offers both Franklin Street postcards for sale. Karl Henry Robinson, son of dentist Henry S. Robinson and Ella H. Davis, was born August 17, 1902 in Attleboro, Massachusetts. He married Ruth Charmion Cotton in Pittsburgh, Pennsylvania, on February 14, 1939. He died in Los Angeles County, California May 29, 1997. 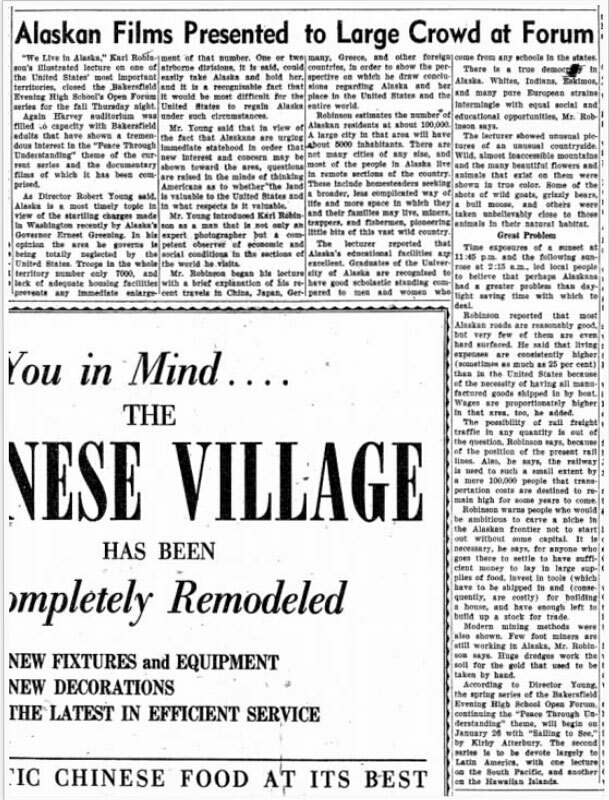 San Francisco Chronicle, March 4, 1939. “Karl Robinson To Deliver Speech On ‘China Journey.’ ” San Bernardino County Sun, 15 October 1950, Sunday, p. 16. (Newspapers.com). 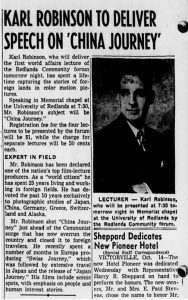 “Alaskan Films Presented to Large Crowd at Forum.” The Bakersfield Californian, 18 November, 1949, Friday p. 22. (Newspapers.com). Massachusetts Vital Records, 1840–1911. New England Historic Genealogical Society, Boston, Massachusetts. (Ancestry.com). State of California. California Death Index, 1940-1997. Sacramento, CA, USA: State of California Department of Health Services, Center for Health Statistics. (Ancestry.com). “Ruth Cotton Married in Pennsylvania.” San Francisco Chronicle, 4 March 1939. p. 107. (Genealogybank.com).